Well I’ve said all I can think of about the hiking but Iceland is certainly a place that’s worth visiting regardless of whether you want to do any walking. Anywhere that the state weather forecast web site also includes a recent earthquakes map has got to be interesting. And Reykjavik certainly is an interesting place. I’m not sure I’d go just to see it, besides it would be crazy to miss the rest of Iceland if you did, but it’s definitely worth exploring. 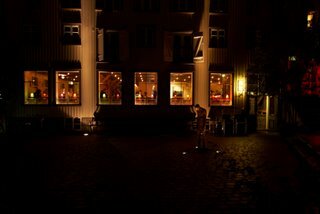 For a capital city, despite the huge size of its suburbs, it’s surprisingly reminiscent of small-town Sweden. We stayed in, and would highly recommend The Three Sisters Guesthouse. Thor and Sonja were incredibly helpful, allowing us to leave spare bags with them whilst we were away (twice) and also finding rooms for us when we turned up a day earlier back in Reykjavik after we’d double-dayed the last stretch to avoid a night at altitude in a severe storm. Like all the Icelanders that we met, they spoke perfect English (and even Swedish, in Thor’s case). The Three Sisters is quite easy to find, being very close to the old harbour and the two Whale Watching companies. But it’s certainly worth printing a map and marking the location so that you can wave it at the cab driver at the BSI coach station. The ability to leave a bag at the place that you stay in Reykjavik is very useful and not uncommon (though often charged a small amount for). It means you can bring things like books, smarter clothes etc. and pack your rucksack into a larger “flight bag” to protect it, and also to use as the bag you leave behind. Not far from The Three Sisters on the way back into Reykjavik was the Geysir Bistro that served truly excellent food, in great surroundings with really welcoming staff. Book it if you can – it gets filled up. If you can find the Cultura Bar (it’s easy, it’s directly opposite the old Opera House) pop in for excellent beers and very nice food with great chilled-out music. On the subject of beer – we never did manage to find the much searched for “ludicrously expensive pint” that we could spend the next twenty years complaining about in British pubs. Sure the beer wasn’t cheap but it wasn’t more than a third or so more expensive than the UK. I’ve paid a fair bit more in Copenhagen (more than once – well, it’s so nice…). Though maybe that’s less to do with how expensive the UK has become and more to do with how shaky the Icelandic economy was becoming. Overall Iceland is expensive, but if you’re doing some walking and camping for a stretch of your stay that will certainly reduce your average cost per day. But back to the beer… One thing to be wary of, in common with the Scandinavian countries, is that shops often sell 2% versions of the normal beer in almost identical packaging. It’s cheaper and in fact is a generally perfectly good beer, great for lunch time. But it can catch you out if you’re expecting something stronger. 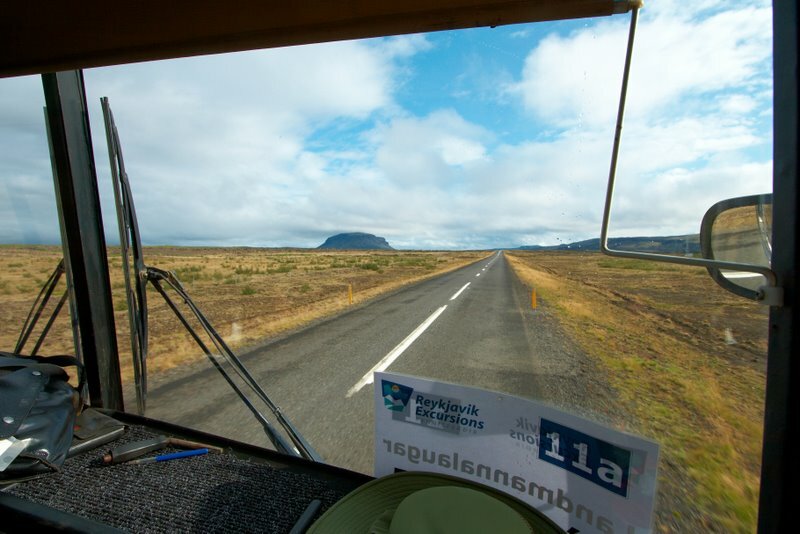 The only way to get around Iceland is by road. I imagine no one has ever been crazy enough to try laying train tracks on the shifting volcanic landscape. If you have a chance, hire a car. Though don’t even think about taking anything less than a properly equipped 4X4 into the highlands. You probably won’t make it, and you certainly won’t be insured! We used the coaches out of the main BSI coach station. Which were fine for getting from A to B but for seeing the sites they were very rushed and on a couple of occasions the drivers were very uninformative. On one occasion the coach left one person behind at Þingvellir (Thingvellir) (the site of the first Parliament) who then hitch-hiked to catch up with us. He was even more annoyed when he found that for the next stop we actually doubled back to the bottom of Þingvellir – within five minutes walk of the stop he’d been left at. Meaning that he hadn’t needed to hitch, and the rest of us hadn’t needed to spend 45 minutes in a boring road-side cafe in the mean time. We decided to spend a night at the camp site at Geysir. If you’ve got a tent anyway it’s well worth it. It only cost around six UK pounds. Whereas the hotel was around ninety pounds, plus food. But since you can still use the geo-thermal hot-tubs, pool and bar even if you’re just camping, it seems crazy to pay that and miss the opportunity of camping within a few metres of bubbling fumaroles and spouting geysers. 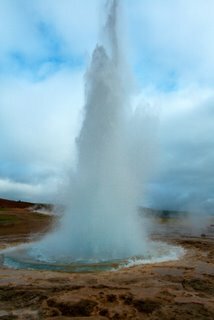 We really were very glad to have stayed overnight at Geysir. Otherwise the coach only spends forty five minutes there so you hardly have time to walk once around the area and get a shot of Strokkur before being whisked off again. Spending the night let us soak the place up – in the hot tub. They sell cans of (full strength!) beer in the tourist shop across the car park from the pool. You can sit in steaming sulphurous water peering across the plain at the distant peaks. Perfect. 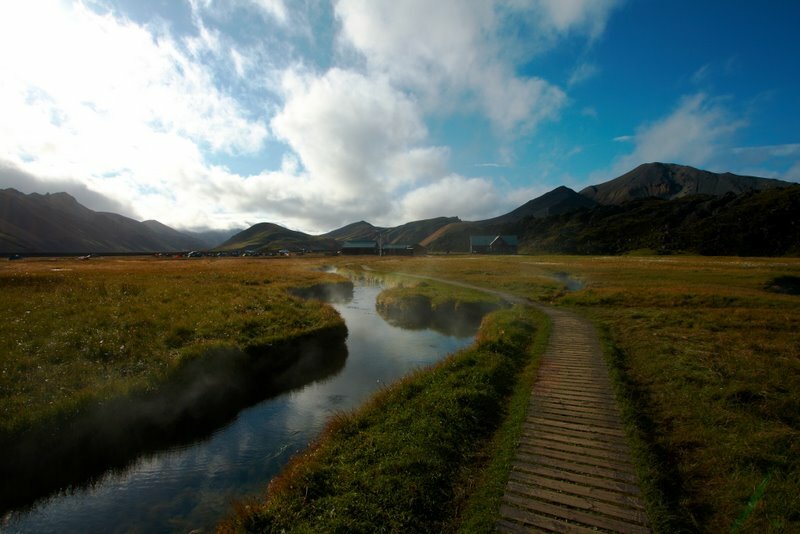 Many people visit the first (Landmannalaugar) and the last (Þórsmörk – Thorsmork) huts on the trail by coach. From Landmannalaugar you can go riding on Icelandic horses. Crossing rivers and tölting (an extra gait that other horses can’t do) across the crazy landscape is an experience not to be missed. We also fitted in some whale watching (as mentioned – very, very close to the Three Sisters). It’s easy to book online and good fun scanning the sea for whales or dolphins. Don’t go expecting to see huge creatures breaching and falling back into the ocean with a fountain of spray. It’s more about hunting for a black shape breaking the surface or maybe some dolphins playing with the boat. We all enjoyed it though. 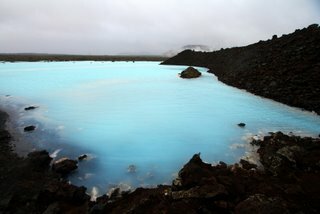 Because we double-day’d the last section of our walk we just had time to fit in a visit to The Blue Lagoon. The slightly touristy nature of the information I’d seen on it had put me off somewhat but I was wrong. It was very chilled-out in a well organised Nordic fashion, with a bar that allowed the drinks to be taken in to the steaming warm water. I’d highly recommend paying the extra for a large, luxurious fluffy towel as well. It turned out to be an excellent way to round off the trip. When we go again, we will spend more time at The Blue Lagoon. The four hours that we had there flashed past. You need a day to enjoy it. So, even if you’re not into the hiking get the Lonely Planet, and go! 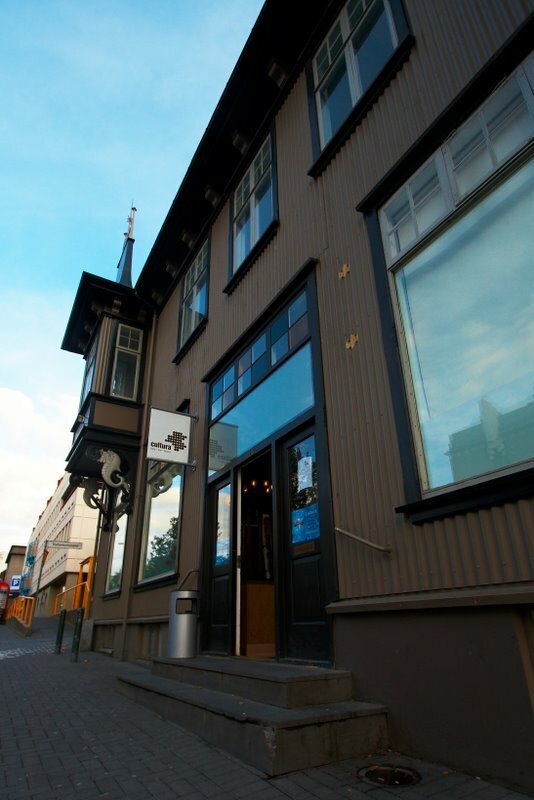 RedYeti – you’ve inspired my wife and me to give serious consideration to Iceland as a destination this year. We’ll be combing through all your posts once again for ideas! Sorry Chris I’d swear I replied to this already! That’s great news. It was another web site that inspired our trip in the first place as it happens (it’s disappeared now – but the Wayback Machine has it). hmm, iceland – the name itself sounds worthy of a visit. 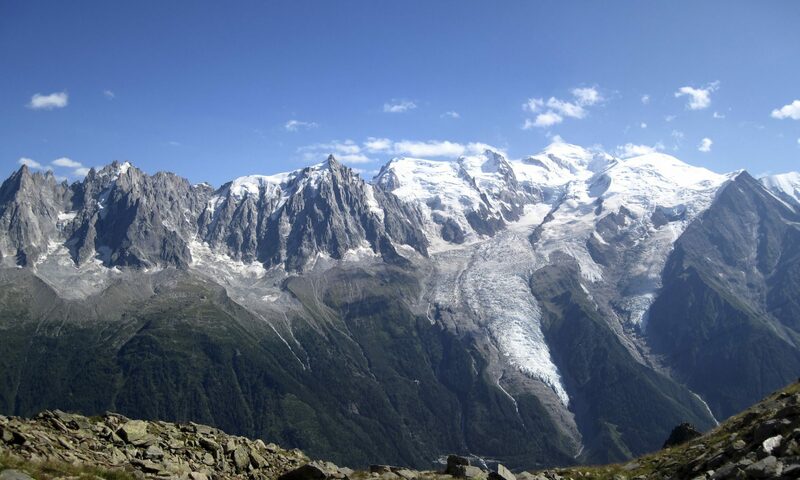 my friends have gone hiking there, perhaps i should see the place too. the geyser shot is really beautiful! !